Making Peace with Autism: One Family’s Story of Struggle, Discovery, and Unexpected Gifts by Susan Senator is a memoir of the Senator family’s experience with their eldest child Nat, who has an Autism Spectrum Disorder (ASD). Senator’s compassionate writing style takes you from Nat’s infancy until his adolescence. 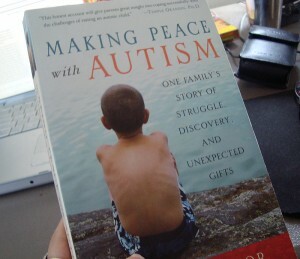 Making Peace with Autism is a useful book with an unfortunate title. This book is ideal for parents whose child is first diagnosed or who are suspecting their child has an ASD. Because of that I fear the title is a turn off to the very audience who could most be helped by it. Usually when parents first suspect their child has Autism and have very little direct experience with Autistic individuals, they go through a period of denial and, I suspect with some, all five stages of grief. For instance, when I told my husband about this book two years ago and mentioned the title he flat out told me, “I don’t want to make peace with Autism.” That was the end of the conversation. He was at the first stage: denial. 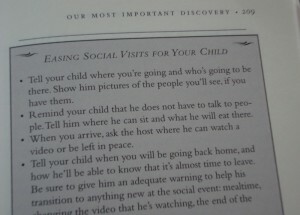 I myself had passed this book over various times when I saw it on the shelf at the Occupational Therapist’s office. That said, when I finally picked it up, this book helped me move through the five stages of grief to acceptance about Tremendo’s Autism in about a week. Before that book, I was stuck between the anger and bargaining stages and I was there for at least a year. Boredom made me pick up the book but it was Susan’s compassion and evocative style that made me keep reading. I was also tired of being angry. I probably read about 30 pages the first time I picked it up while I was waiting for Tremendo’s appointment to end. Senator’s writing made me feel like someone got me. Someone got how hard my daily life was and how lost I felt. Parents in the initial stages of grief over Autism tend to feel like no one understands them, even the people who have actually “been there” but who have come to that place of acceptance. Having someone so honestly say, “I get it, and I know how hard it is” helps them feel safer to face the truth- that their child may not be who they’ve envisioned, that they’ve got to adjust their expectations and most importantly that life with Autism can be good, not your worst nightmare. 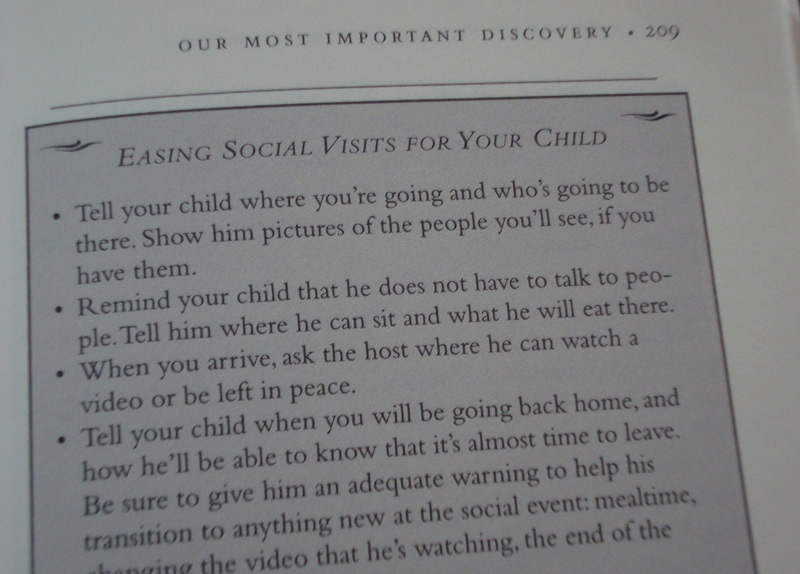 Another reason this book is an excellent tool for parents first encountering Autism on a personal level is the series of checklists (there are over 20) with helpful tips found throughout the book. The tips range from making schedule boards, implementing reward systems, developing a home education program as well as how to handle family events that can be stressful for the child. One tip that was especially useful for me was found on page 120 where Senator suggests giving your child controlled ways to misbehave such as ripping boxes or junk mail. Senator bought cheap shampoo for her son to pour down the drain. We let Tremendo open all of the mail (shredding the envelopes) and rip up any cardboard boxes that come into the house. These tips are ones that veteran parents have learned through direct experience as well as with therapists, schools and other books but are a wonderful help to parents first learning how to cope with the unknown. Senator shares an insight on page 195 that altered my relationship with my children and I feel is a great caveat to those parents who are starting on the path of obtaining treatment for Autism. From then on we would try to understand all of Nat’s actions as human expressions of the need and desire for social contact, rather than simply annoying manifestations of autism. We had inklings of this truth for years, but all of our emphasis on behavior modification had made it hard for us to see. When you respond neutrally to undesirable behaviors in order to decrease their frequency, you may succeed in the end, but you are also cutting yourself off from the person whose behavior you’re trying to modify. In your eyes he becomes a collection of behaviors to reward or suppress, and on some level, he stops being a person to you. This created a light bulb moment for me. I had not realized that all of the perceived physical attacks that Tremendo inflicted on me were simply stemming from a desire to connect with me, not to hurt me. Admittedly I knew he wanted my attention but I was ignorant of the fact that he was doing it the only way he knew how to get it. Trying to be neutral or getting angry about this behavior didn’t change anything and only served to put up a wall that he tried harder and harder to penetrate. After reading that I realized that when Tremendo grabs on to my leg, not letting me walk he is actually “hugging” me because I am doing something he likes. It is his thank you. Those times where he HAD to jump on my back really hard all elbows and knees in my spine were his way of trying to initiate connection. When I realized this I felt some guilt over getting angry and frustrated with his affection as well as for trying to think of ways to stop him from doing these things I didn’t like. I felt sorry for rejecting him. I don’t dwell on that, I just try to remember not to reject him even if my initial reaction from being physically hurt is to lash out. Some days it’s easier to remember than others. Before I sat down to write this review, I decided to do a search to see what others thought of it. Two of the reviews that came up first on the search results criticized this book for the same reason: this was another “autism mom” story. Basically, the reviewers had been there, done that. This serves to further illustrate my point. Veterans may not walk away thinking, “Oh my God, I’m so glad this book exists!” However, it can’t be denied that Senator’s words are helpful and sound to parents who are new to the diagnosis. The issue is, the title may very well scare them off. What I found most helpful about Making Peace with Autism was that once I finally reached the acceptance stage it was no big deal, for instance, to make picture cards for food instead of complain about the fact that he couldn’t just tell me what he wanted to eat. Once I “made peace”, I stopped lamenting about how things weren’t what I had expected. I learned to expect different things. That shift in perspective changed my relationship with my children and because of that I began enjoying our lives together again. One Response to "Book Review: Making Peace With Autism"